1.Check in for registration from 9 am to 11:30 am at the Joe Ritchey Bridge. helps to be early. Pre-registration is advised and encouraged. 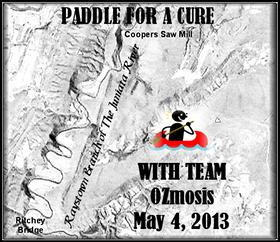 2.You may drop your boat off at the Ritchey Bridge registration area and take yotur vehicle to Coopers Saw Mill. 3. Transportation will be provided to return you to the starting point. If you have a friend one vehicle may be left at Coopers Sawmill and return to the starting point in the other vehicle. Last bus will leave Coopers Sawmill at 12:00 noon. 4. the course is approximately 10 miles and will take three to five hours depending on the speed individuals wish to paddle. We encourage everyone to complete the course by 4:00 pm. Be sure to wear your life jackets! 5. THIS WILL BE AN ALCOHOL FREE EVENT. 7. Food, snacks and drinks will be available at Coopers Saw Mill until 5 pm. (donations accepted}. 8. Drawings for various prizes to be announced based on your arm band number. 9. Chances are being sold to to win a Kayak or cash equivilant. Drawing will be at 4:30 pm at Coopers Saw mill. Chances will be available the day of the event or from any team member.